Riots started in Syria in 2011 after 15 children were arrested in the city of Daraa for painting anti-government graffiti on the walls of a school. In that same year, the revolution in Egypt produced a spike in revolutionary graffiti. As their government tried to silence citizens, street art became a universal form of communication that reached people around the world. These are some of the examples artist Paul-Felix Montez references when he talks about the power of street art and symbols. Symbolism is an art form that can be traced back to renaissance art. The power of symbolism lies in its ability to tell stories. Symbols create a universal language, transcending international and cultural borders. Paul-Felix has been fascinated by symbols throughout his career. He recognizes the peace symbol as an authentic symbol that represents our needs. "Peace is the highest ideal. It enables us to love, have families, fix differences.." Montez set out to reinvent the peace symbol and start a global movement. 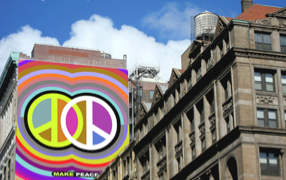 After contacting artists like George Colon, the Make Peace Project was born. The Make Peace Project encourages global street artists to use the new proactive peace symbol, engage in grassroots activism and change their world and communities. The project has become an umbrella for "Make Peace Day" and other grassroot movements. "Make Peace Day" takes place "as it falls on the Saturday after or on Spring Equinox every year". It promotes and celebrates every individual's ability to do something peaceful through action. 25,000 people participated online in March 2013. The "Make Peace Park" grass movement aims to make peaceful parks by taking back abandoned or high crimes areas. The idea is not to push out middle or lower classes, but to rebuild and create a shared area of support for all citizens. On September 14, 2013, thousands of artists will gather in Brooklyn, New York to join the world's largest single collaborative artwork movement of the 21st century. NYC will be the project's launchpad and result in a major gallery exhibition. All works of art will incorporate the reinvented peace symbol.The Project will continue in other international cities like San Francisco, Paris and Berlin. "It will not stop" Montez says. "Museums make us spectators, but this event makes us participants. It will not stop because Peace is not an option. It is a necessity for human survival."